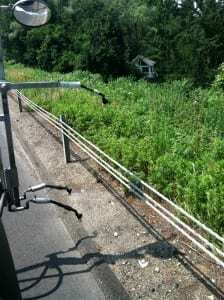 Vegetation control along roadsides is necessary to maintain the integrity, function and safety of those systems. Highway and roadsides serve as a major source for the spread of invasive and noxious plants. The rapid and abundant growth of vegetation is a major cause of concern. Unmanaged noxious weeds can become a hazard to roadside safety, blocking the view of traffic control signs, approaching vehicles, pedestrians or wildlife. Control of these weeds improve visibility, keep sidewalks and break-down lanes clear, allow drainage systems to function properly, preserve pavement from root breakthrough, and maintain overall road safety. All Habitat Services regularly provides their vegetation management services for the State of Connecticut on divided highways, Rights of Way and specific locations. Application of selective and non-selective herbicides under guide rail, to paved islands, along jersey barriers and around light poles and signs are used for the control of Phragmites and other vegetation. For more information, take a look at our team in action.